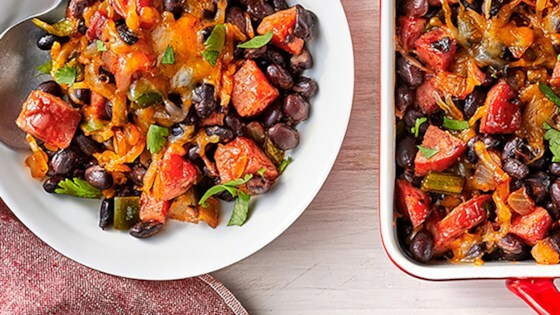 "Whip up this Southwestern-inspired dish for an easy, effortless meal, in partnership with Hillshire Farm Brand." Heat oil in a large skillet over medium-high. Add sausage; cook 2-3 minutes until just starting to brown, stirring occasionally. Add onion and poblano; cook 4-5 minutes, stirring occasionally, until vegetables are softened. Add cumin and cook about 30 seconds, stirring constantly, until fragrant. Remove from heat and stir in ketchup, brown sugar, lime juice, chipotle peppers, Worcestershire, salt, pepper, and beans. Spoon mixture into an 11x7-inch (2-quart) broiler-proof baking dish coated with cooking spray. Cover with foil. Bake until bubbly, 35 to 40 minutes. Preheat broiler to high. Uncover beans and top with cheese. Broil until cheese is melted, 2 to 3 minutes. Sprinkle with cilantro. Actually, have not made yet, but have been cooking long enough to say this sounds good!